If you’re on this page, it’s because you’re looking for the best smart lock, right? We have done the work for you, and we bring you the best high-security door locks in the market. So, if you plan to convert your home into a SmartHome, pay attention. The successor to the well-received August Smart Lock, August 2nd Gen is similar to the previous one, but with better quality, reliability and features. It allows you to access your home without the need for keys and controlling everything that happens in your home through your smartphone without any complications. Another advantage is its ease of installation. You will not need help from anyone and you can start enjoying the smart lock on the same day you buy it. You can share temporary virtual keys with all your friends or family so that they can get access too. The main attraction is the design which looks extremely beautiful and the compatibility with all kinds of smart devices. It works with Amazon Alexa, Apple HomeKit, Nest, IFTTT, Wink, Logitech Harmony, Logitech POP, iOS and Android devices. The only con we found with this is that it does not have a secondary manual lock. It supports only wireless access through mobile. So if you happen to lose your smartphone, it will be an issue. 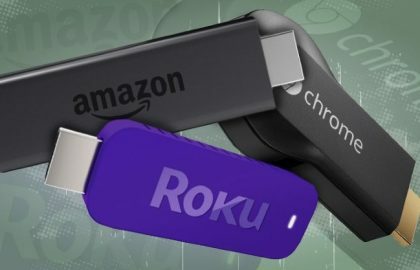 It is true that you could keep the traditional lock, so that, if you ever break your mobile, router or Smart Lock itself, you can still access your home. However, it is much more uncomfortable than having both options in the same lock. In short, the best Smart Lock you can get if you are not bothered about the ‘keyless’ only feature. You can consider August Pro + 3rd Gen which packs many more features but comes at a cost of $250. The Schlage Sense Smart deadbolt is one of the latest smart locks on the market, and if you are a tech-savvy Mac user, this might be the one you have been waiting for. The Bluetooth equipped Sense offers exceptional performance, security and many smart options, including the ability to open your door by giving commands to Siri. 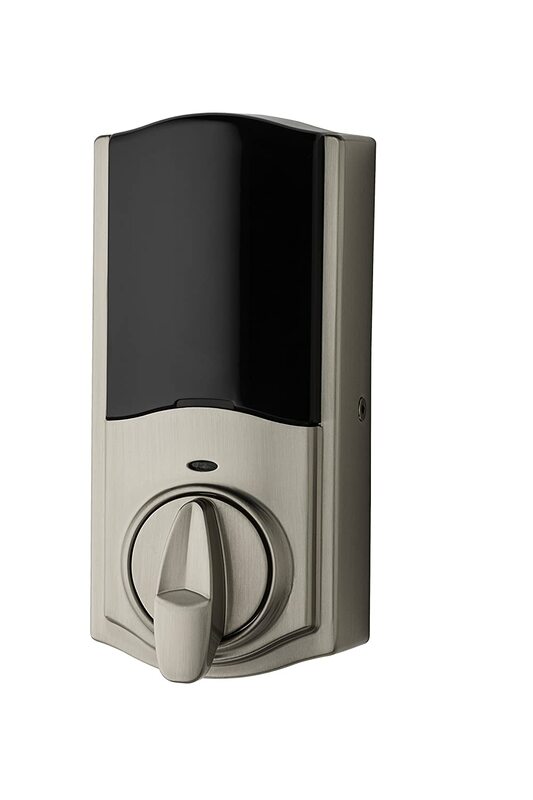 Schlage offers the sense in a range of colors – satin nickel, matte black or bronze. All of these models are available in the modest and clean Century trim or Camelot trim. I like the Century trimming in nickel, which is sleek, a brushed metal that goes along well with my existing device. The touch screen is equipped with a Schlage button at the top, as well as a check mark indicator and a red “X” to activate the indicator. It took me about 20 minutes to install the lock and complete the set up using an iPad. After the lock is engaged, you need to run a compulsory system test to check if everything is working correctly. You can set the codes manually on the lock if you have no Apple products, but you can find lot more features if you connect via Apple HomeKit. HomeKit, Apple’s home automation system, is still fairly new and has only a handful of other compatible devices, but it gives you full control over the Sense remotely. The Sense Smart lock has its own app, you can program new codes, and can view a history of when and by whom the door was locked and unlocked and you can lock and unlock yourself of course. 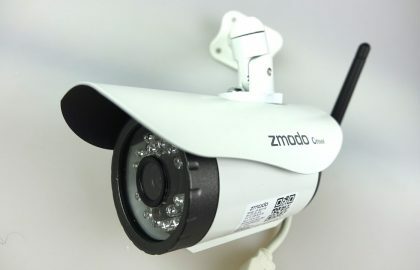 You can connect the sensor to Apple TV but since the lock works via Bluetooth only, your Apple TV must be within approximately 40 feet of the lock, which can be a problem in larger houses. If you have an Apple TV and HomeKit-compatible accessories such as lighting, thermostats, coffee machines etc you can build a fully automated home. The use of Siri is undeniably entertaining, the operation with a key code also proved to be easy and reliable. When you touch the Schlage logo on the top of the touchscreen, the backlight turns on and you can enter your code. Then the green check mark on the lower left corner will flash two times, and the door will open. If you have the auto-lock feature, the door will lock automatically anywhere between 5 and 30 seconds after the door is closed. User codes can be between four and eight digits, but they must all be the same length. Up to 30 codes are stored at a time, and there are two different types of codes available. You can set the Sense to beep whenever the door is opened or closed, and forced-entry detection will give a very loud 30-second alarm when significant force is applied to the door. Schlage Security has long been known for the quality and the safety of its products and the Sense Smart deadbolt one of their best. If you are a dedicated Apple user – especially with an Apple TV and other home automation devices like HomeKit, then the Schlage Sense is a great choice for a smart, secure lock. Update: The latest model is compatible with all the devices which running Android as well as iOS and with other smart devices also. Although many of these smart locks have similar features and aesthetics, the August Smart Lock stand out from the crowd. It is easy to install, you can use your existing lock and is compatible with Apple’s HomeKit, what means that you can lock your door using voice command. The lock itself looks very modern and is available in silver champagne, dark gray or red. The packaging and product design are minimalist and clean, very different from other smart locks on the market today. Instead of the long rectangular box, I am accustomed to, the August is a circle, slightly more than 3 centimeters in diameter and only 2 inches thick. The August Smart Lock is easy to install than other smart locks because the only installation is needed on the inside of the door. It does not replace the existing deadbolt but it does not have additional security features to add unless you purchase the tapered deadbolt separately. 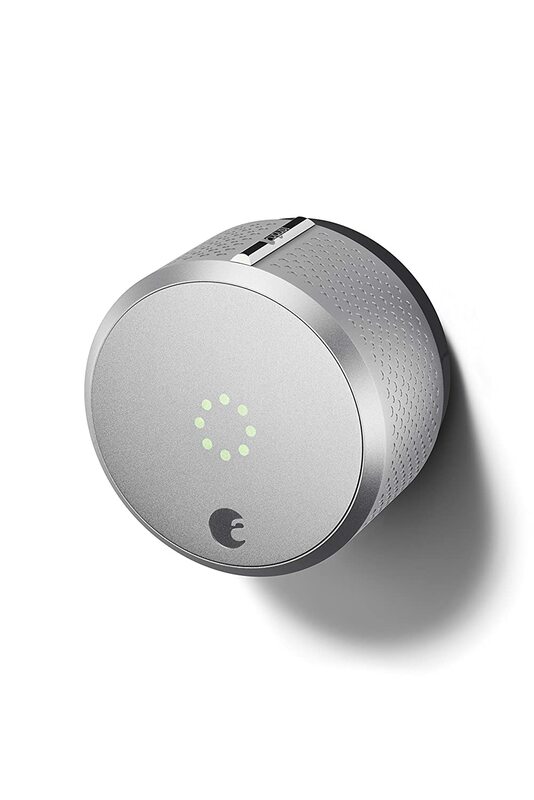 The August Smart Lock offers add-on components to increase its capabilities: a wireless keyboard, a doorbell cam that allows you to see and talk to visitors, and the August Connect, which serves as a bridge between the switch and your Wi-Fi Network. Using the lock on a smartphone is also easy. The August Smart Lock works with Bluetooth technology so that you can use to unlock your door with the click of a button on your smartphone, as long as you are within range of the lock. Whether you are using an Android or Apple smartphone, just go to the app store and download the free August Smart Lock app. The August Smart Lock with Connect is very versatile and can be opened a few different ways. 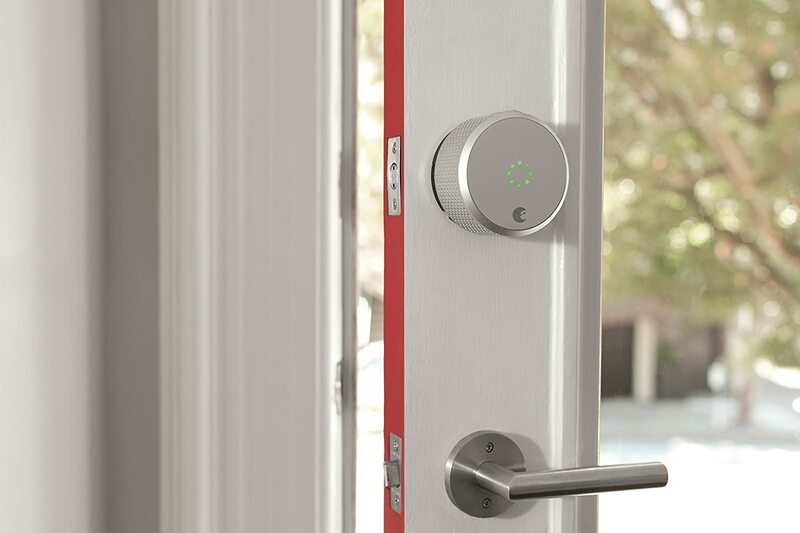 From your August Smart Lock app, simply press the Circle, and as long as you are within Bluetooth range, the circle turns green and the door will open. It should be noted that there is a delay between pressing the button and door is unlocked which is annoying sometimes. The auto-unlock feature, which is available only to Apple users currently, will unlock the door automatically when you walk more than 100 yards and return back. If you choose to enable the EverLock option, the deadbolt lock automatically within 30 seconds after the door is opened and closed. The traditional deadbolts available in the market allows only a limited number of keys or a paid additional keys while August has unlimited virtual keys you can set to avoid the hassle of deleting old codes to make space for new. You can even get a history of when and by whom the door was opened. The lock is HomeKit compatible, so iPhone owners can connect via Bluetooth to their Apple TV. 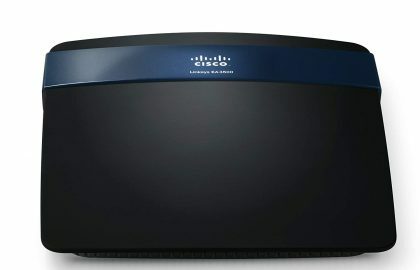 Otherwise, you will need to purchase the August Connect, which serves as a bridge between the switch and your Wifi network. August’s lock is one of the few smart locks currently works with Nest products, so you can program the Nest Learning Thermostat to turn on when you unlock the front door. For the money and the difficulty of replacing your existing lock, you can instead take into account the Schlage Connect, which has a built-in keyboard and burglar alarm. But if you want to use the lock with Apple and Nest products to build a fully automated home, consider buying August Lock. The SmartCode 916 is sleek and modern, and it is designed to go along with any existing decor. At first sight, the night lock seems heavy, sturdy and well constructed – and that perception is validated once it is installed. On the left bottom of the screen is a checkmark symbol that turns green to notify that a successful action has been done and the bottom right is a closed padlock symbol for one-touch locking. The interior panel of the 916-night lock looks discreet and is surprisingly minimal. It is certainly easier to manage codes on your smartphone than to go through the process of using the keypad. It took only 30 minutes to set up the whole thing. Having a master code gives only one person the possibility of adding or removing user codes on the lock. The master code may not open the door unless the same code also is set as a regular user code. The SmartCode 916 is one of the fastest devices I have seen with not a single delay at all. The bright white LED backlight makes the figures easy to read, to power on, you just need to touch the screen anywhere. With Kwikset’s in one-touch lock function, you close the door behind you and press the lock symbol in the lower right corner of the touch panel to lock the door, just easy as that. The Smart Code 916 is BHMA Grade 2 certified, uses 128-bit encryption and is equipped with Kwikset’s patented BumpGuard locking bar to protect from tampering. If someone types in the wrong code one after the other, the deadbolt beeps and it is loud enough to be heard in the house. If the lock is connected to a smart home hub, a warning will be will be sent to the person with the master code. 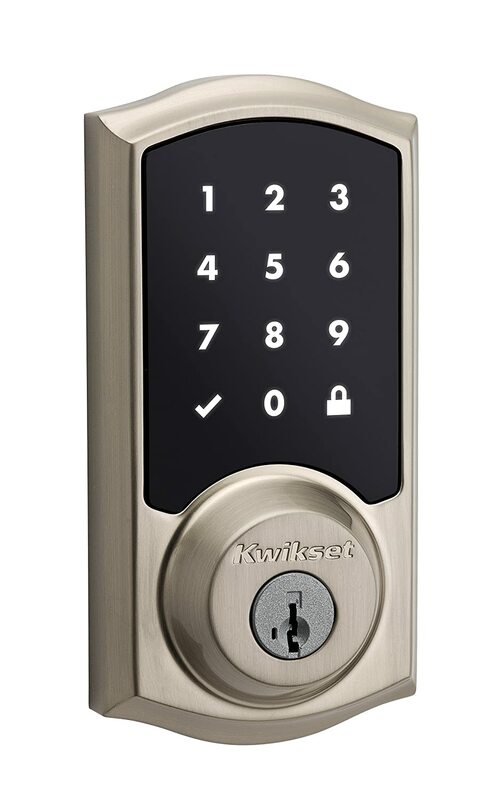 The Kwikset Smart Code 916 is a solid smart home deadbolt with an easy to use and responsive touchscreen. The installation is easy even for non-tech-savvy users, and the keyless entry and one-touch locking are useful features. 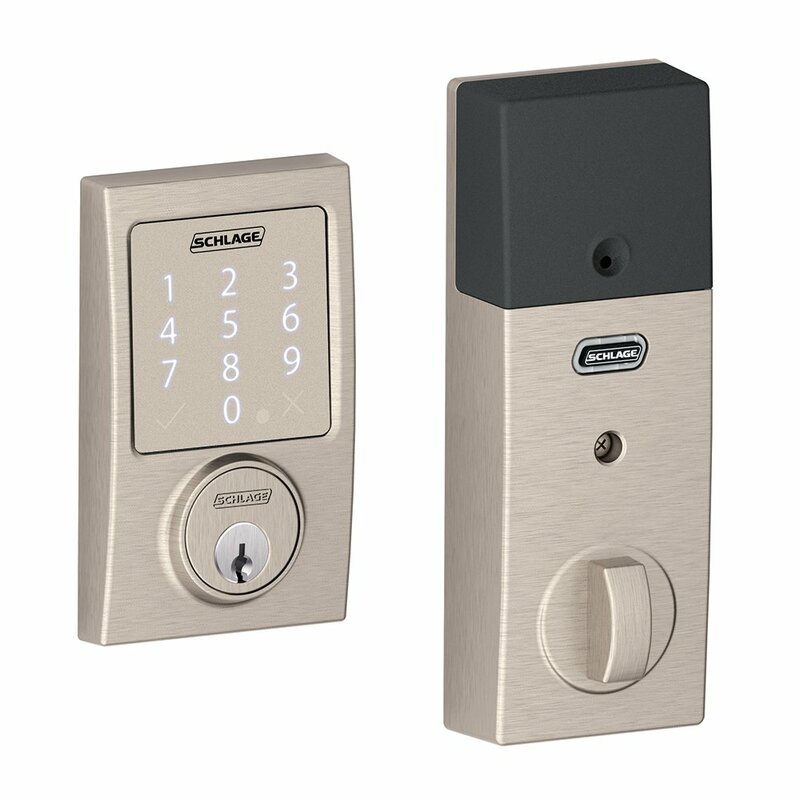 Unlike the Schlage Sense, the Kwikset SmartCode is a bit smaller and less conspicuous and allows you to use your old keys if you want to. This beautifully designed door lock uses a capacitive touchscreen to lock and unlock your door and can be configured with either a Z-Wave or ZigBee wireless module to a make it a part of your home automation system. However, the only thing missing, with the exception of the keys, is an app to operate remotely; for that, you need Z-Wave or ZigBee home automation controller. The design is pretty standard for a deadbolt but with its own elegance and beauty. The touch screen numbers remain dark and invisible until you to brush your hand against the panel, at which point the numbers light up. The device uses four AA batteries to power up the lock. An LED indicator that lights up when the lock is activated are located under the battery housing, and below is the thumb-turn lever is used for manual opening and closing of the lock. The lock comes with a strike plate and locks bolt, four AA batteries, mounting hardware, installation and programming instructions and a quick start guide. The whole set up takes only 30 mins and is really easy if you follow the instructions manual. Once set up, the One-Touch Locking option lets you relock the door by touching anywhere on the touchscreen rather than using a PIN code. 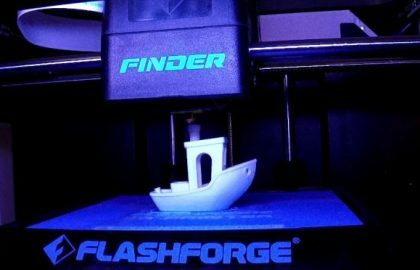 I had no trouble locking and unlocking the door with my smartphone, but that is almost everything you can do with this specific model for now. If you want the system to interact with other connected devices, you need a network such as the Mi Casa Verde Vera system which allows you to do things such as to unlock your door, turn on lighting, to disarm your security system with your smartphone. Other home automation networks, such as the Control4 system can help you to make daily and weekly access diagrams and view the history logs when the lock is activated. 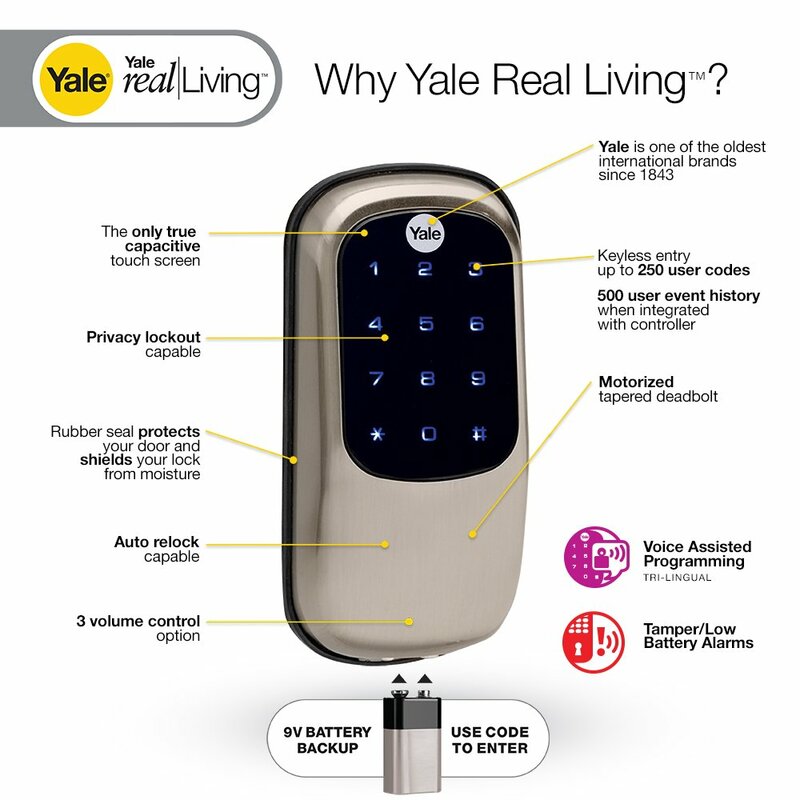 The Yale Real Living Z-Wave Touchscreen Dead Bolt Lock offers a stylish way to safeguard your home or business, without the need for keys, and because it can be configured with either a Z-Wave or ZigBee wireless module, it can be incorporated with a variety of home automation-networks. This is one of the best-known smart locks, which offer multiple possibilities for a lock. This elegant looking smart lock packs a lot of features for the money. It is an intelligent lock that can operate through a key, but it gets Smart where we can operate from the smartphone by a single touch. In addition, you can control it from a distance using the mobile application, whether you use iOS or Android. 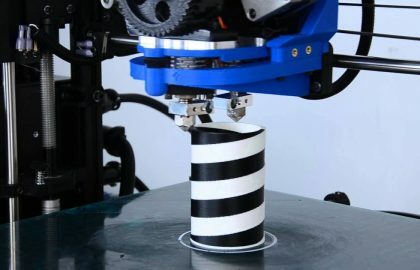 Another interesting point is that it is very easy to install, so you will not need anyone to help you do it. 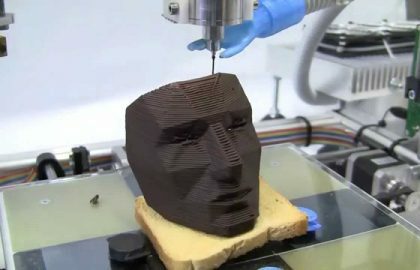 You can do it yourself without any difficulties. One drawback is that it doesn’t have the typical code system that can be seen in other smart locks listed here. In fact, there are many people who do not want an intelligent lock that works with codes, because they also have their security problems. So, in the end, it depends on the tastes of each one. Many have reported Bluetooth issues and compatibility issues with certain smartphones even though in our test we didn’t find any such issues. So read the reviews carefully before buying this. In our opinion, the Kwikset Kevo Smart Lock 2nd Gen is one you can consider buying, but there are other better options too. The Kevo Bluetooth lock is equipped with a single cylinder deadbolt lock assembly, an interior housing, two traditional keys, two eKeys, four AA batteries, and all the hardware you need to install the lock. The Kevo’s design is simple with a flashing ring around the lock. The light ring makes use of different colors and flashing codes to let you know things such as when the batteries need to be replaced, if the smartphone or fob out of range, an unauthorized is attempted to access, or the lock is jammed. If you know how to install a door lock, the Kevo installation process is relatively easy and only takes minutes to finish the process. Once set up, you can download the free app from the app store to connect wirelessly using the smartphone. From the main menu, you can set up add locks, send eKeys and check notifications. You can set ‘Admin rights’ to different users so that they can assign, edit and delete eKeys or ‘Anytime rights’ with which they can lock or unlock the door, but contains no management capabilities. In the Settings menu, you can view and edit information and calibrate fob or iOS device, and My user’s tab allows you to view all active and inactive users by name. The Kevo performed admirably well in all our tests and was responsive to all the eKeys although there was some delay between action and execution. The app also keeps an accurate log of everything without issues. If you are an iOS user you can consider buying this but the lock doesn’t support other platforms which is a big drawback.